The original Big Muff pedal of the 1970s was born after years of analysis using various distortion pedals. The idea was to be able to build a low-cost unit that could produce great, overdriven tones with plenty of long sustain. Back then, the Big Muff pedal was larger in size, and many musicians found this to be a slight disadvantage due to the amount of space it would take up on a pedalboard. The Electro Harmonix Little Big Muff incorporates all the favourable features of the original Big Muff but in a much smaller unit, giving you more valuable space on your personal pedalboard. The die-cast chassis of the Little Big Muff has been designed to be incredibly strong and durable, whilst being conveniently compact. Electro Harmonix proclaim this pedal to be "the finest harmonic distortion-sustain device developed to date for the electric guitar player". Over the years, this sort of pedal has been well-revered by famous musicians all over the world and is still popular to this day. The Little Big Muff is kitted out with three simple controls for Volume, Sustain and Tone. It is the Sustain and Tone controls that enable the user to achieve their ideal violin-esque sound with as much or as little distortion and sustain as you wish. 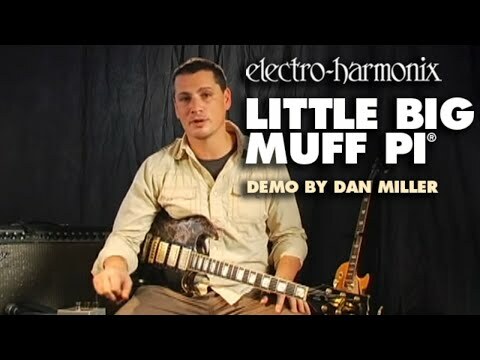 The Little Big Muff could have you riffing just like Jimi Hendrix. The pedal can be powered either by a 9V battery or via optional 96DC-200BI power supply. It is a true bypass pedal and is easily engaged using the footswitch.